As you know, I've tried a number of toy patterns since Ellie was born. I've been hoping to find one that was quick but gave results that I could comfortably and proudly give away as gifts to little ones. I always found something to criticize in the earlier efforts, either in the pattern or in my execution. 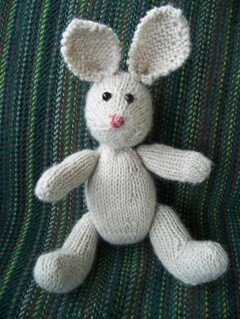 But this pattern, from fuzzymitten.com, may be what just I'm looking for. I rushed through this one -- used a yarn I probably won't again (Wool-Ease), inexplicably picked up 7s when the pattern calls for 6s, tried my own thing with the nose, didn't like it, tried to remove it and ended up leaving the cropped floss-ends as the nose...but Ellie and I both love it. When I actually do it up right, my extra efforts will render it hideous, I'm going to make a million of them and give them to all the children I know (with embroidered eyes for safety for the littlest ones, of course). The pattern is very clear and not terribly fiddly. There are clothes patterns for these guys, too! I'm really pleased with the whole shebang. It's Roadster from Rowan 33. 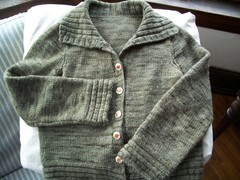 The pattern was written for All Seasons Cotton, and I used Araucania Nature Wool, so it is pretty cropped. But I really like it, and it's wearing well. I think I might have made it in 2004. The buttons are porcelain with hand-painted red chrysanthemums on them (I think they're hand-painted, and I think they're chrysanthemums, anyway). They were given to me by Clark's mother, who brought them home from a trip she took around the world when she was in her 20s. I think they're Japanese. I think she just put the trip together herself, and went. I always admired her for that. Also for being able to find a souvenir to give to me from a trip taken long before I was born! She also gave me some beautiful blue Thai silk that she had kept all that time. My own mom then sewed it into an amazing dress that I wore many times in the 1990s. But that's another story. In fact, that may be another story that I've already told here. But it really is a beautiful dress. Hope my Chicago peeps are able to keep frostbite at bay. Heat wave this weekend, though -- it should get up to freezing. P.S. to Sue -- I had to smile when I saw your Lynton -- I already had the pictures of this sweater ready for a post when I saw yours...they could be (fraternal) twins! I made the bag ages ago (Nov. '06, that is) using this tutorial. I thought it was a trial run and would live in the closet or eventually donate its parts to science, but I've ended up carrying it a lot. This season, its plain front just spoke to me, "Emmmbelllliiisssh meeeeee" Startled, I complied. 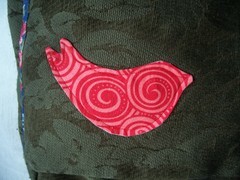 So this is fabric and interfacing, cut out using this bird template, sewn right-sides together, all the way around. Then you cut a small slit in the interfacing, turn it right side out, et voila! Carolyn might not even remember this (though she might), but she explained how to do this to me once months ago while riding home from a KIP. Ah, bloggers! Where would I be without you? Friendless and bagless on a frigid, snowy Chicago day, that's where. Though I would still have airtight windows, and that would help. Sorry to keep you looking at the same post for so long! I can't find the cable that lets the camera talk to the computer, so even though I'm working on things and even have taken photos of them (! ), I can't post them. I lost the cable because we had to move everything out of the study and I "put it in a safe place" where I would "be sure not to lose it." The good thing is that the clean-up was needed because we got new windows in the front of the house. They face west, and our century-old windows ushered Siberian air into the house like an old friend. The difference in warmth in these rooms is absolutely unbelievable. Seriously. The curtain in the study doesn't blow in the draft from the closed window! Sure wish I could find that cable, though. Unusual (at least in our ZIP code): The postal carrier gives us a card that is addressed to a family that shares our street number, but lives two blocks east. The other family's surname starts with the same prefix as ours, so the mistake is understandable. Sort of weird: We know the husband of the other family from college. We ran into them a couple of times around the neighborhood and know that they lived two blocks east, but didn't realize they had our same street number. What are the chances? : The card is from a long-ago ex-boyfriend of mine who is also a longtime friend of this other family. Clark brought up the mail that day and said he had some interesting questions when he flipped through the letters, looking first only at the return-adddress labels. Like, why are this guy and his wife sending us a Christmas card?!?! Hope you had a wonderful week! I was so relaxed, I hardly recognized myself. Note the use of the past tense. Oh, well! 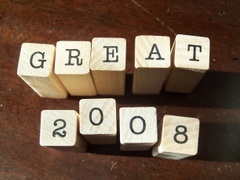 Here's to another wonderful year of blogging and knitting/sewing/crocheting/whatever-else-occurs-to-us!